VATICAN CITY (CNS) — Surprising pilgrims at Blessed John Paul II’s tomb, Pope Francis made an early morning visit to St. Peter’s Basilica and celebrated Mass with the mostly Polish pilgrims. More than 100 priests and pilgrims were gathered Oct. 31 at the basilica’s Chapel of St. Sebastian for a morning Mass near Blessed John Paul’s tomb. Pope Francis arrived unannounced to preside at the liturgy and prayed for the late pope’s intercession to help today’s Christians be strong, not weak in their faith. Being Christian means putting God at the center of one’s life and drawing strength from his boundless love in order to persevere in hard times, Pope Francis said in his homily. “Without Christ’s love, without living this love, recognizing it and being nourished by it, you can’t be Christian,” he said, according to a full transcript of the homily released by Vatican Radio. Christians are people who “feel watched over by the Lord — with that gaze that’s so beautiful, loved by the Lord and loved until the very end,” he said. 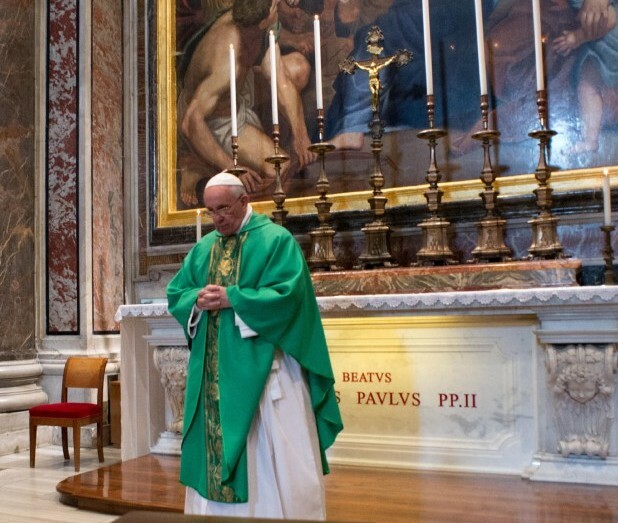 Pope Francis focused his brief homily on the day’s Gospel readings, which looked at St. Paul’s assurance that nothing “will be able to separate us from the love of God in Christ,” and St. Luke’s account of Jesus’ sadness when Jerusalem rejected his love. St. Paul, who feels weak and sinful, finds strength in God’s love in order to bear tremendous difficulties, the pope said. Jerusalem, on the other hand, is unfaithful and unwilling to be loved by God, he said. Jesus, who yearns to gather the children of God together, like a hen gathering “her brood under her wings,” suffers when people reject his love, the pope said. These people live God’s love just halfway: “a little bit, yes, a little bit, no, depending on what’s convenient,” he said. Instead, the best way to fall fully in love with God is by encountering the Lord and experiencing the life-changing event of salvation, he said. “Christians feel that their life was saved by the blood of Christ. This relationship of love creates love,” he said. What kept that love and trust strong in St. Paul’s life, even during times of illness, persecution and betrayal, was keeping his life centered on Christ’s love, the pope said.